he Owl Club is a remarkable remnant of the Victorian period of Cape Town, South Africa, being a gentleman’s dining club formed in 1894 to provide a social meeting-place for those with an interest in the liberal arts and science. The members are entertained and informed by a strong tradition of excellent speakers and a high standard of music. It was the wife of the first Secretary, C. G. Lowinger, that coined the name. Soon after the genesis of the idea of its formation, four men sat in the twilight near the Royal Observatory in Cape Town discussing what it should be called. W. E. Ranby, the first chronicler of the Club, takes up the tale: “Into the gathered darkness came Mrs Lowinger with the natural inquiry, ‘Why are you all sitting here in the dark like a lot of owls?’ ‘The very name for our Club!’ they cried, and the Owl Club it was called and remains” (Ranby 1952: 7). Members are designated as “Brother Owl” or Owl so-and-so. 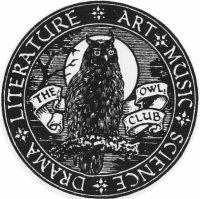 The first formal meeting of the Owl Club took place on 1 October 1894. Down the years, the Club has met in various venues in the City of Cape Town. Between 1975 and 1988 it met at the Cape Town Club (formerly the City and Civil Service Club) in Queen Victoria Street. Since 1998, the venue for meetings has been the Kelvin Grove Club at Newlands, Cape Town, usually in the Grill Room. The Owl Club maintains a tradition of monthly dinners for Members and their male guests; “black tie” is the customary plumage. The normal pattern of each meeting comprises a main speaker, always a guest, followed by a musical item which may be provided by an Owl or by an outside performer. There follows a bar interval, when the Owls and their guests move around to chat, often congregating around the bar. The second part of the meeting features a shorter talk by an Owl which, because of its purposeful inconsequence, is nicknamed “The Waste Paper Basket”. A second musical item closes the evening. By convention, speakers are requested to avoid such references to religion, sexual matters and party politics as may give offence; English is the only language used for the addresses. If possible, the delivery should be what one of our great former presidents referred to as “A light touch with something behind it”. The speaker is not subjected to interjections, nor is he required to answer questions after his address; and experience has shown that it is generally undesirable to invite them. The Press are not present but the proceedings are recorded and a monthly digest is circulated to Members. Members are classified into one or more of five Faculties which best describe their main interest: Art, Drama, Literature, Music or Science. The category might mirror a Member's profession, though there are many Members who have an interest in one or more of the Membership categories without engaging in it professionally. Membership is by invitation only. The fitness of a prospective member is judged initially by his proposer and seconder, who present his curriculum vitæ for consideration by the Committee of the Owl Club. He should have demonstrated some distinction in his area; but the overriding criterion should be his ability to dwell in harmony with his fellow Owls. So, on occasion, members have been elected more for their “clubability” than for their distinction, and this is perfectly acceptable. The Club meets on the third Tuesday of each month, with the exception of January; in December, to avoid a “bump” with the Christmas meeting of the Oxford and Cambridge Club, the meeting may take place on the previous Tuesday. Meetings commence at 8.00 p.m., preceded by a dinner (6.30 p.m. for 7.00 p.m.) and last until about 10.30 p.m. The Owl Club enjoys reciprocal arrangements with the Savage Club of London and the Melbourne Savage Club in Australia. The origins and history of the Owl Club from 1894 to 1950 are recorded by W. E. Ranby in The Owl Club 1894-1950 (Cape Town: The Owl Club, 1952). Eric Rosenthal and other Owls continued the account for the years 1951 to 1981 in a collective history, The third Tuesday (Cape Town: The Owl Club, 1982). For its centenary publication, the Club decided to compile an anthology based on the addresses to Owl Club members in the period since 1981: The unjealous years: an Owl Club anthology, selected and edited by James A. Henry, with illustrations by Tony Grogan, Joe Lister and Townley Johnson (Cape Town: The Owl Club, 1996).